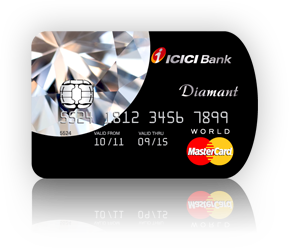 Presenting the ICICI Bank Diamant World Mastercard Credit Card. Nothing represents rare privilege and elegant luxury quite like a Diamond. Taking our inspiration from this Monarch among gemstones, we'ev created the ICICI Bank Diamant, a card that provides its patrons with exclusive access to some of the most incredible experiences on the planet. Membership to the ICICI Bank Diamant is available by invitation only. Welcome on-board with the MacBook Air MMGG2HN/A, a notebook like no other, perfect to complement your unique lifestyle. You will receive this welcome gift post realization of the Joining Fee. "Card Member" shall mean a customer to whom the facility has been granted by virtue of such customer holding the ICICI Bank Diamant Credit Card. "Card" shall mean the ICICI Bank Diamant Credit card, which has been issued by ICICI Bank. "Facility" or "Programme" shall mean the Programme where ICICI Bank Diamant Credit Card Members are eligible to get a complimentary Apple MacBook Air MMGG2HN/A on the payment of the Lifetime Fee. "Welcome privilege offer " or "Welcome gift offer" or "Joining gift offer" shall mean a complimentary Apple MacBook Air MMGG2HN/A provided to the card Member in cases where the facility is availed during the Programme Period. "Eligibility Criteria" for availing the Gift Offer of a complimentary Apple MacBook Air MMGG2HN/A is the payment of the joining fee as specified for the card during the Programme Period by the Primary Card Member. "Programme Period" shall mean the period commencing from the launch of the card after which the cards are set up and valid for such period till which the facility is terminated by ICICI Bank. The Programme is valid for all Card Members who meet the Eligibility Criteria and have paid the Joining Fees under the Lifetime Fee option in accordance with the Primary Terms and Conditions. Any cancellations or foreclosures on the facility before the dispatch of the Welcome Gift will amount to cancellation of the Welcome Gift Offer to the Card Member. A Card Member will be entitled to only one Welcome Gift Offer during the Programme Period. Welcome Gift Offer is non-transferable, non-binding and non-encashable. No substitutions or exchange of the Welcome Gift, other than what is detailed in the communication sent to the Card Member shall be allowed. However, ICICI Bank reserves the right to substitute and/or change the Gift or any of them on account of non-availability of Gift, without any intimation or notice, written or otherwise to the Card Member. All visuals of the Welcome Gift in the communication sent to the Card Member are indicative only. The facility shall be available to the Primary Card Members only. ICICI Bank shall not entertain any exchange or replacement related requests for the Welcome Gift items on any grounds/reasons whatsoever. The Gift voucher may be redeemed at any Croma outlet on or before expiry. The complete list of the Croma outlets where the Gift voucher can be redeemed will be printed on the Gift voucher and is also available on www.icicibank.com. No substitutions or exchange of the Welcome Gift, other than what is detailed in the communication sent to the Card Member shall be allowed. The Card Member may however, at the time of redemption of the Gift voucher, choose to upgrade the version of the Apple MacBook Air MMGG2HN/A, by paying the difference in the amount of Apple MacBook Air MMGG2HN/A and the upgraded version of the MacBook. ICICI Bank shall not be liable for the payment of any such variable amounts or any other issues related to the upgraded version MacBook. The Gift voucher may be redeemed by the Card Member only once and redemption or use of the Gift voucher against photocopy of Gift voucher shall not be valid/permitted. The Gift will be directly sent to the Card Member, within 45 days of payment of the Joining Fees for the card. In such cases, no request for exchange or replacement of the Welcome Gift will be entertained by ICICI Bank on any grounds whatsoever. ICICI Bank reserves the right to modify/change all or any of the terms applicable to the Programme without assigning any reasons or without any prior intimation whatsoever. ICICI Bank also reserves the right to discontinue the Programme without assigning any reasons or without any prior intimation whatsoever.